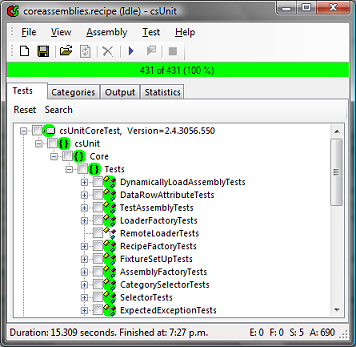 csUnit is a free and open source unit testing tool for the .NET Framework. Unit testing is tightly associated with test-driven development (TDD), refactoring, and other practices from agile software development approaches such as Extreme Programming or Scrum. Technical discussions and announcements for csUnit are available through our Yahoo!-Group csunit or through one of our forums at SourceForge. Standard unit testing features such as test, fixture, setup, teardown, ignore, expected exception, etc. April 17, 2009: We are in the process of revisiting the way how tests can be selected for execution out of a large set of unit tests. In particular we want to improve the usability of csUnit current features for that task (categories, selectors, filters). Furthermore we are looking into a way to make an updated version of the code documentation available on our web site and for keeping that current. March 28 2009: csUnit 2.6 released. This version is based on .NET 3.5 SP 1 as well. It contains basic support for executing NUnit and Microsoft unit tests (VS2008). Furthermore we fixed several bugs. For more details please see here. March 10, 2009: We have moved the code base of csUnit to .NET 3.5 SP1. Also we have added some basic support for executing MSFT based unit tests (VS2008). The supported attributes at this stage are TestClass, TestMethod and ExpectedException. All this is already integrated into trunk and will be available in the upcoming release. We have also received requests for csUnit to run on 64 bit systems. We are looking into this but haven't decided yet in which version we will be able accommodate that request. June 08, 2008: csUnit 2.5 released. The majority of the changes are usability improvements. In addition we have also revisited the installer and the Visual Studio addin. April 16, 2008: We are working on the next version. Focus this time is improved usability. For instance with the increasing size of test suites you may like to learn that we will include a search feature to navigate to tests very quickly. Currently we plan for a release date in May. However that can change depending on our progress, which in turn depends on how much of our spare time we can put in. March 29, 2008: Relased "Troubleshooting csUnit Addin" (PDF, 173 kBytes) available from our support section.